SaltStack, developers of the full software stack for configuration management, data center infrastructure automation and cloud orchestration, today announced it has been named an InfoWorld 2014 Technology of the Year Award winner. *InfoWorld editors note SaltStack speed and scale for data center orchestration. 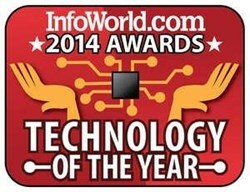 For the 2014 Technology of the Year Awards, the InfoWorld editors consider the best products reviewed during the previous year. Hardware, software, development tools and cloud services are all considered. InfoWorld reviewed SaltStack Enterprise in October 2013 giving it an 8.8 out of 10 score and commenting that SaltStack “keeps server automation simple” and is “the sleekest and most robust” of the configuration management and server orchestration tools reviewed. SaltStack software provides flexible, easy-to-use software for real-time infrastructure automation, cloud provisioning and orchestration, and application stack configuration management. SaltStack is known for its speed and its ability to scale unmodified to support environments with tens of thousands of systems with no performance or functional degradation. Join SaltStack customers, users, developers, core engineers, and partners at SaltConf, the annual SaltStack user conference, from Jan. 28-30, 2014 in Salt Lake City. More details can be found at http://www.saltconf.com. *InfoWorld.com, “InfoWorld's 2014 Technology of the Year Award winners,” Paul Venezia, Jan. 15, 2014. Follow @SaltStackInc on Twitter: http://twitter.com/SaltStackInc. Follow SaltStack on Google+: https://plus.google.com/+SaltstackInc/. Hack with the Salt community: http://www.saltstack.com/community. SaltStack is a complete systems management software platform for fast and scalable automation of any cloud, application stack or data center infrastructure. Specifically, SaltStack is used by system administrators and developers to automate configuration management, private cloud building, public cloud orchestration and autonomic infrastructure. The Salt open source project was launched in February of 2011 and is now one of the fastest-growing, most-active communities in the world. SaltStack was founded in August 2012 to support the Salt project and to deliver SaltStack Enterprise packaged for the world's most-dynamic large and small businesses, web-scale applications and clouds. SaltStack won an InfoWorld 2014 Technology of the Year Award, won the 2013 GigaOm Structure LaunchPad competition, was named a Linux Journal Reader's Choice product in five categories including "Linux Product of the Year" and "Best New Commercial Application," was named a Gartner 2013 Cool Vendor in DevOps, and was included on the GitHub Octoverse Top 10 list for 2012. For more information, please visit SaltStack.com.